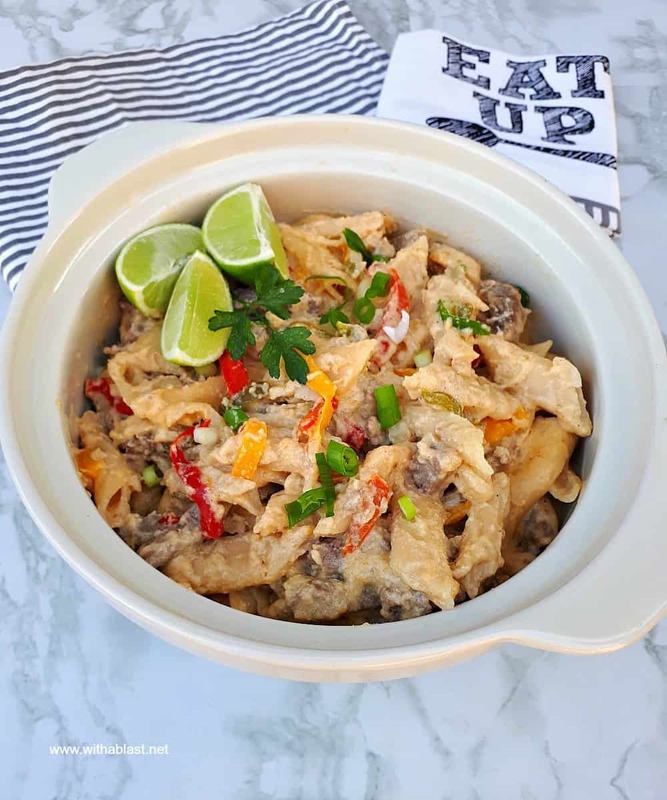 One Pot Spicy Steak Fajita Pasta has all the flavor a traditional Fajita has, but in a pasta dish. A Quick, easy dinner dish for a busy week night. Since I started my diet and eat differently from the rest of the family, I have not cooked in quite a while. Fortunately hubby knows his business in the kitchen by now ! But, I miss cooking ! 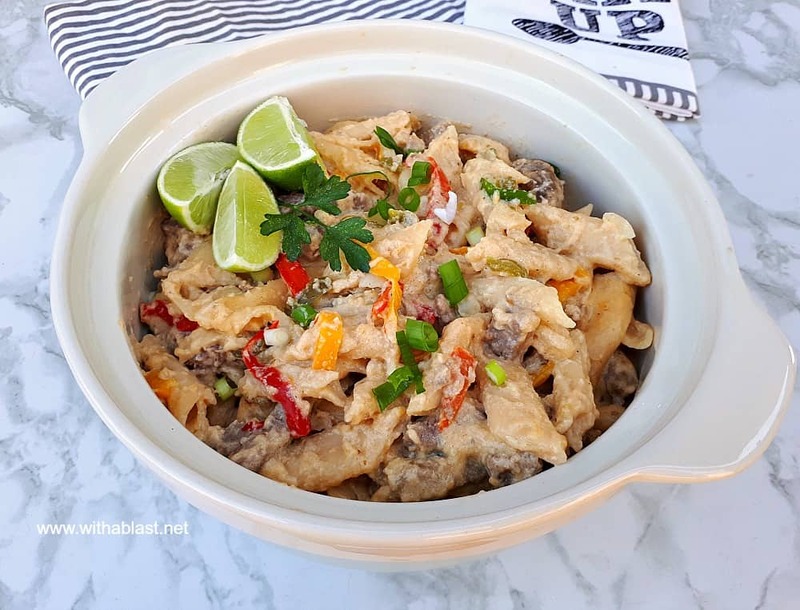 This week I decided it is time for me to start cooking dinner for them again and this One Pot Spicy Steak Fajita Pasta was on the menu list. I also made a sheet pan dinner, but lo and behold – each and every time I make a sheet pan dish, it starts raining, or is very overcast, just as I start. Hence, me not sharing the recipes, as I take all my photographs in natural light. Every once in a while I tell myself to get sorted out with a proper photography kit. But … I am super-superstitious and do not believe in open umbrellas in a house ! I know there are other options, but the umbrella kits look so easy to use. Well, I will just have to get my head around into buying a kit, because I hate not being able to shoot photographs of delicious recipes and share them here on the blog. Right, never mind me and my phobias ! 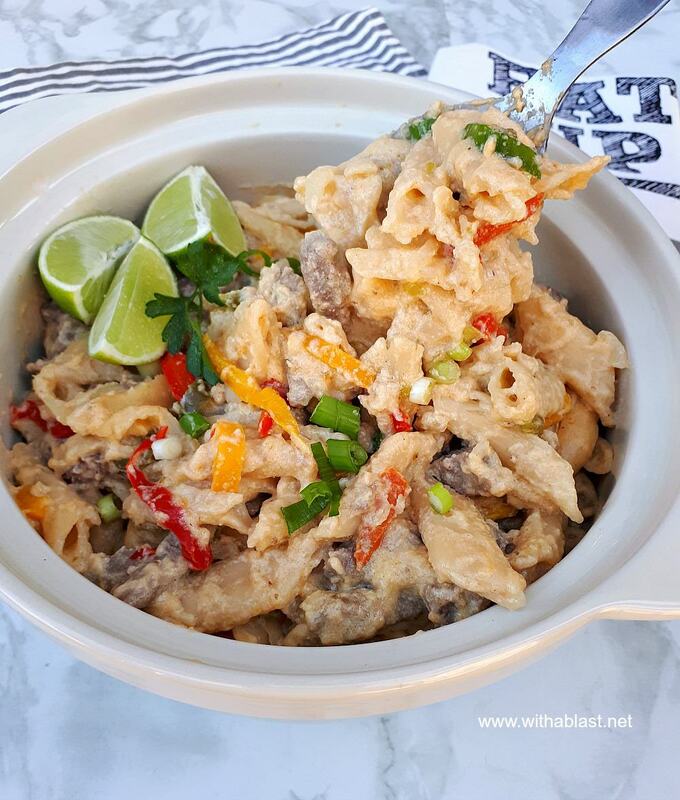 This Spicy Steak Fajita Pasta is so tasty and the flavors always work so well together. I thought we had Tortillas in the pantry, but did not. Therefore I turned an already popular dish into a pasta dish. Same taste but instead of wrapped in a Tortilla this is now a pasta. All dished up and ready to be enjoyed ! From start to serving it took me about 40 minutes to get dinner on the table. Not bad, especially for a dinner dish during the week. I did however check on the dish a couple of times during cooking and gave it a stir now and then. The pasta sticks to the bottom a bit, not a lot, but do give the cooking dish a stir or three. 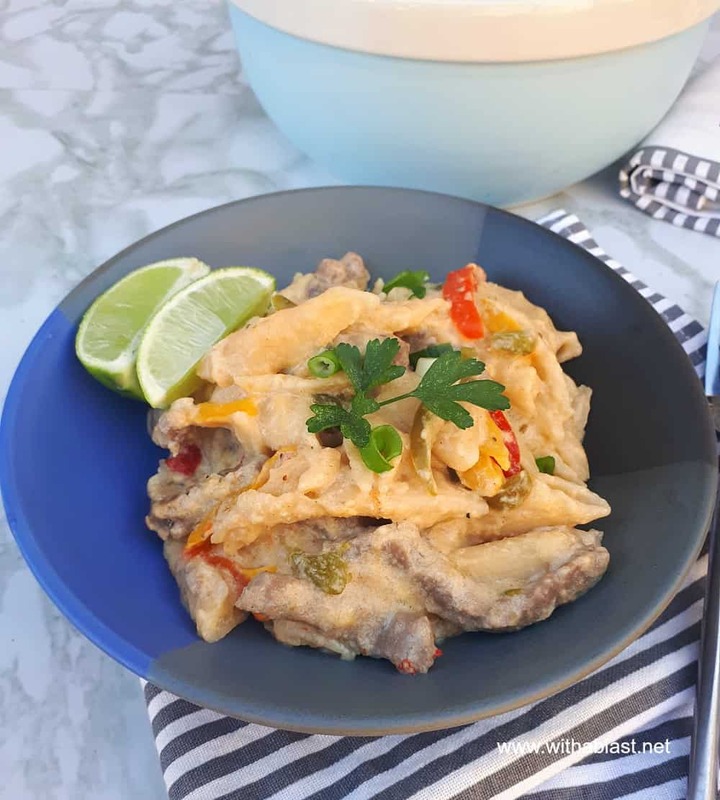 The Lime wedges give a delicious bite to the dish, however I do not think younger kids might like the Lime taste. In the recipe I mention 4 – 6 servings. This is for either 4 adults, or 2 adults and up to 4 kids. Steak and pasta? Yum! Always looking for 1 pot meals! This looks like it would be a winner with my family. And a big win for me! One pot, delicious meal, and little cleanup is the dinner trifecta! 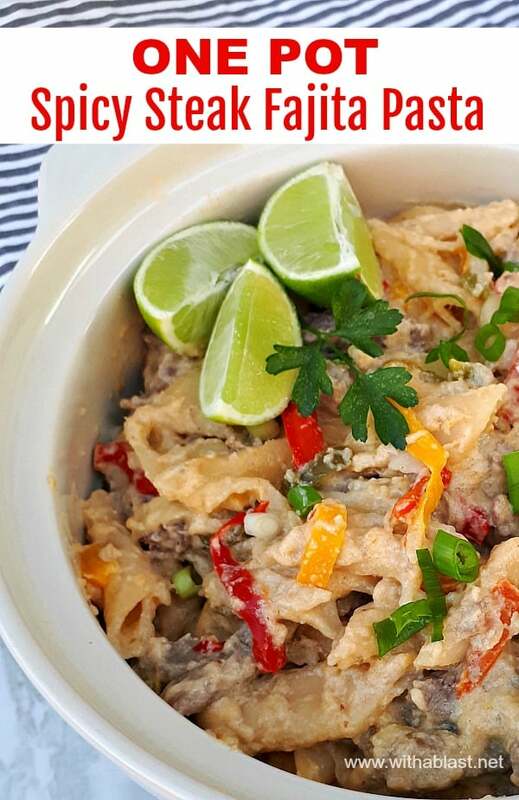 Great idea to turn fajitas into pasta! My family would love this! Well that was a great idea to turn the fajitas into pasta! Sometimes the best recipes come from substituting a usual ingredient that you didn’t realize you were out of! I know exactly what you mean about not sharing recipes due to no natural light. It is so hard when you make something good but the weather doesn’t cooperate for pictures! 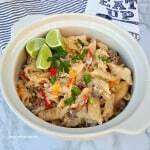 I think my husband would love this spicy one pot meal. Thanks for sharing the recipe. I love food fusions. Pasta with steak fajitas sounds super good to me. What a great idea!!! I love this idea! Yummy pasta recipes are my favorite and I can guarantee my husband will love the spicy flavor! Can’t wait to try it!